Barbara B. wrote in to ask me what’s inside the strawberry. You know, the strawberry that dangles off of the iconic tomato pincushion. That strawberry. Excellent! Now I know that fine grain sand is called “emory.” Except that the person writing the very interesting short little history of the tomato pincushion probably spelled it incorrectly. I think it should be “emery” instead of “emory” mostly because that’s also the stuff that emery boards are made of. So, perhaps “sand” isn’t quite right, but I think it’s close enough. Be that as it may, I would now like to step up and correct a common misconception. These little strawberries are NOT to sharpen your needles. Seriously. If jamming the tip of your needle into soft fabric dulls it, how would jamming the tip of your needle into sand sharpen it?! Note the word “polishing” in the above definition? An old hand quilter from way back, I have my own theory. When you hand stitch with the same needle over time, it oxidizes. That is, the nickel plating on the steel needle tarnishes. You might even have noticed that it turns black. It sticks a bit as you attempt to push it through a quilt, especially if the quilt has been sandwiched with a dense batting like cotton. The perspiration on your hands is responsible for the tarnish. And how would you remove the tarnish? Stick the tarnished needle into the strawberry! Holding it by the needle end, pinch the strawberry, and slide the needle in and out, rotating it every so often. Tarnish removed! I rest my case. Well, not completely. There’s one more thing. I think my little theory is further strengthened by the fact that, proportionately, the strawberry is usually way smaller than the tomato, except in Barbara’s really nice pincushion picture. If it were bigger you’d loose your #10 between inside the strawberry never to be seen again. Or, maybe it’s just because back in the 19th century strawberries really were that small. They were not the genetically engineered giants that we’re used to getting in the grocery store today. They probably tasted better too. The real ones. Not the ones with the sand inside. I’ve always been told it was to sharpen the needle and thought it was a great idea. Enjoyed your research and story. Thank you for sharing it! Oh my the interesting things you learn when your curiosity hits google. Now what is corundum? In an interesting side note…this is Julius Caesar’s actual person motto. ” Non illigitimus corundum” which loosely translates into…never let the b@$! @rds get you down” That Julius was one smart cookie. I’m glad you straightened us out about not using it to sharpen our pins. I’ve always planned to sit down some day and patiently “sharpen” all my pins. Thank heavens I never had the time! Sould have known, but it’s so easy to believe those old myths. I always thought it was to sharpen the needles too. Made sense to me because I used emery boards to get burrs off my needles/pins. Maybe way back when it was used for that, maybe needles weren’t made as smooth .. As far as needles sticking when hand quilting, I was told to rub the needle with my hair. I have done that for years and it always worked. Holey Socks! What DON’T they sell!!! The collective knowledge of my blog readers is impressive indeed! Before you throw away an old pincushion, cut it open…. you will be SHOCKED at how many “MIA” needles are hidden inside! I bet! And what a huge mess! My nose is already itching…. I always thought that emery was a kind of crushed iron or steel. Never to old to learn something new. I like to use the strawberry to “sharpen” new cheap pins we use for our charity quilts at church. Many pins sold as quilting pins are difficult to put into the fabric sandwich, must be the oxidation that comes on them. Thanks for the enlightenment! Emery and diamond and carborundum are all substances chemists call network solids. The atoms in them are held together by covalent bods, which are very strong, and go on for the size of the particles, instead of ending after a certain number of atoms, the way molecules do. One of their signature properties is hardness, which is why they are used for whetstones (carborundum), nail files (diamonds), emery boards (emery), drill bits and saw blades (carbides), and strawberries! Ami is right, the emery is designed to remove any imperfections on pins and needles, which was more important when needles rusted! Kathleen – quilter and retired chemistry teacher! and… Emery: Long used as an abrasive or polishing material, particularly in sandpapers, it has largely been replaced by synthetic materials such as alumina. Its largest application now is as a nonskid material in floors, stair treads, and pavements. from Merriam-Webster.com…. I LOVE CURIOUS minds…. they are usually creative minds! Yup, strawberries “back when” did taste a whole lot better before they were “engineered” to be big, beautiful, and capable of traveling long distances. The strawberry patch from my childhood produced the yummiest berries ever. I’ve searched for years to find the specific plant without success. I live in NY. When I was in elementary school, we learned that emery was a mineral mined in upstate NY where it is supposedly very abundant.. We also learned that it was used in commercial polishing. I don’t remember what they were polishing other than needles, but at 64, I’m glad I remember anything at all. That’s quite a bit of remembering! Good for you! Sixty years ago, I had strawberries for the first time; they were tiny, no bigger than the first joint of my finger, sweet as honey, and picked from the plants that grew wild along the fence of the pasture at our neighbor’s house. One day she gave me some of her cultivated strawberries, great big beauties they were, but tart and very disappointing. Missy here. I know why they have those strawberries hanging on the tomato pin cushions! It is for us dogs to pull off, just like the tags that come on our toys. The eyes are next. yummy. My mother, RIP, taught me when I was a boy–on a teeny tiny strawberry–that careful insertion of the needle into the “gravel”, then a few rotating motions, would sharpen/polish the needle. She also said it could preserve a needle’s overall surface but never recommended it. Needles are inexpensive enough. My aunt taught me a neat trick: she used the strawberry as a working pincushion for her three favorite needles. Mom was born in 1917, Aunt born 1911. The problem with your theory however is that it is incorrect. Shoving the point of a needle past abrasive grains removes microscopic pits of metal from the sides of the leading tip. The tip would certainly be dulled if the abrasives were immobilized but they are not. the greatest difficulty a person trying to create a sharpened edge on steel faces is having a fine rolled edge of metal clinging to the sharpened edge, it’s called a wire burr. When sharpening a knife or chisel the craftsperson pushes the knife edge first against the sharpening stone to cut the metal away to the back edge of the knife where no bur is able to form. I do not quilt but I was taught hand sewing needle arts (embroidery) starting at age 5 (54 years ago) I still do a great deal of hand sewing. I also became fascinated with woodworking at the age of 11 and went on to pursue a degree in woodworking with a minor in textiles. I have been sharpening everything from scissors to hand planes for over 30 decades. Thank you for your comment, but I never suggested the strawberry was used to sharpen the point of a needle or pin. 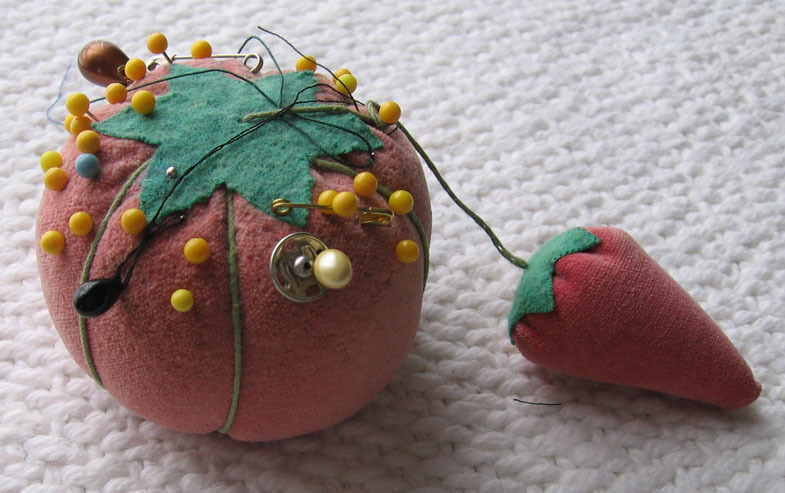 I was particularly interested in the history of the tomato pin cushion but the link on this page does not work. Sorry. I’ll have to hunt down that link and see if I can fix it.